The search for natural medicine for gout has never been stronger. As traditional medicines come under the scrutiny of scientists, it seems as if a new gout home remedy lurks in every kitchen cupboard. Of course, reliable gout treatment may be a distant hope in some cases. Extracting reliable, consistent, active ingredients from herbal sources is always difficult. However, man has a strong history of finding gout relief in the natural world. Colchicine from the crocus springs to mind. So, is there a chance that we may find a gout remedy in Yunnan Flower Bud Tea? Shang-Tse Ho and colleagues certainly think so. They have reviewed several traditional medicines and investigated extracts of a plant officially known as Balanophora laxiflora. This strange-looking plant has its roots in traditional Taiwanese medicine. 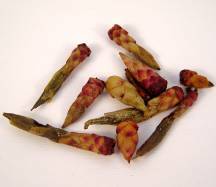 But we’re not interested in roots at the moment… We want to see if the flower buds can help gout sufferers. I will summarize the investigation of this plant extract soon, but I am intrigued by the recent surge in interest in medicinal plants. The study of Yunnan Flower Bud extracts includes a few references to other potential natural medicines for gout. Yunnan Flower Bud tea is widely available. Search for it next time you are buying from Amazon.com, or Amazon.co.uk. The cheapest source I found is Generation Tea where you can try a 2oz starter pack or save money with larger sizes up to one pound. 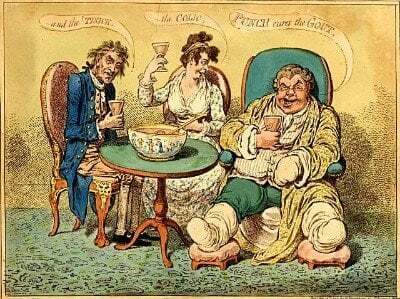 Of course, the strength of a home infusion is unlikely to match the extracts prepared in the lab, but I would be interested in seeing your experiences in the gout resources forums. Known under various names, including Chan, Bushmint, & American Mint. Various uses, but often seen as a weed when growing in cultivated land. Chinese cinnamon, or just plain Cassia, is widely used as a spice and as a medicinal herb. White mulberry inner bark is roasted and ground into a meal then used as a thickener in soups etc or mixed with cereals when making bread. The white mulberry has a long history of medicinal use in Chinese medicine, almost all parts of the plant are used in one way or another. Related to the cashew nut, an Indian traditional medicine used for the treatment of gout, rheumatoid arthritis, and inflammatory diseases. I intend to summarize these investigations once I complete The Hypouricemic Effect of Balanophora laxiflora Extracts and Derived Phytochemicals in Hyperuricemic Mice. Have you used herbs as a gout home remedy? Please share your experiences, or ask questions in the gout resources forums.